My husband LOVES Asian food! Have I already told you that? I might have. Nevertheless, the man LOVES it! And who doesn’t love sweet and sour sauce in particular? Am I right? Unfortunately, most Americanized Asian food comes with a lot of added sugar, grease, large amounts of animal fat and artery clogging deep fried options. Old school Asian food is where it’s at. Small portions (or none) of meat or tofu, lots of veggies and moderate amounts of rice. Which reminds me, did you know that the typical American portion of meat for one person would typically feed an entire family in China?! That’s crazy to me! They typically only use it to flavor the food. Not as the main event. And we wonder why Asian cultures are so healthy and live to be so old. Now there’s some thought for food! No, I didn’t say that wrong. Thank you (AGAIN! ), Forks Over Knives, for your amazing knowledge and plethora of facts that continue to amaze me! If you haven’t seen this documentary, friends, YOU MUST! Now, let me reel myself back in here and get back to the task at hand. Some nummy sweet and sour goodness that’s guilt free, baybay! Tempeh is so delicious! In this recipe, I braise it in a little vegetable broth first. This helps flavor it! If tempeh isn’t your thing, you can easily swap it for some tofu or seitan. I had orange bell pepper on hand so that’s what I used but you can use any or as many colors as you like. Add baby corn, water chestnuts, carrots, green beans…whatevs! You could also just make the sauce and use it anyway your heart desires. It’s free from artificial colors and it’s well balanced. Not too thick, not too sweet and not too tangy. A huge hit with the hubs and the toddler! Perfect. In a pan, braise the tempeh in vegetable broth and Bragg’s liquid aminos on low heat for 10 minutes. Once braised, remove tempeh but reserve the liquid. You’ll use it to make the sauce. Heat sesame oil in a separate pan. Brown the tempeh in oil for 3-5 minutes. To make the sauce, add the juice from the pineapple, cornstarch, brown sugar, ketchup and vinegar. Bring to a simmer. Add peppers, celery and onions* to the sauce. Sauce will begin to thicken almost immediately so keep stirring. 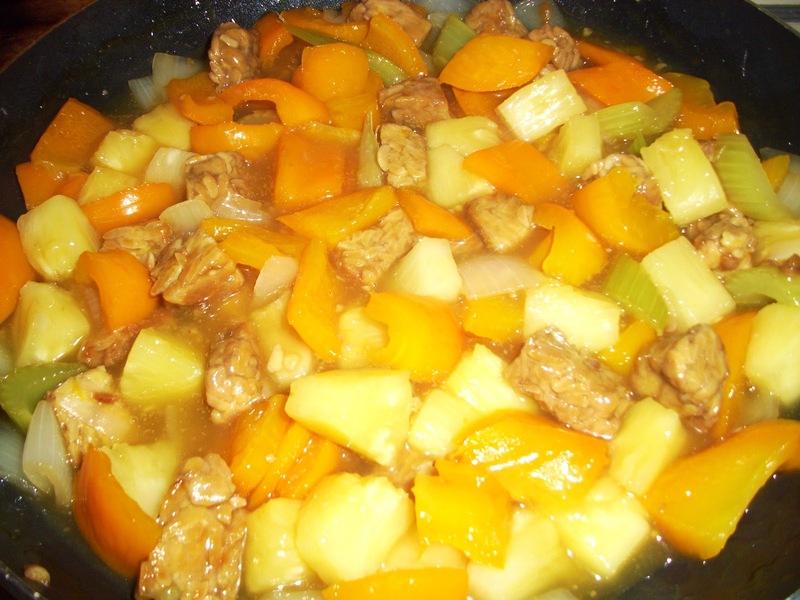 Once sauce has thickened, reduce heat, add tempeh and pineapple, combine well and serve over rice. *I like my veggies a little crispy. If you wanted to pre-steam or saute these before adding you can always do that first. Previous Post No Bake Peanut Butter Coconut Balls! Next Post Tosca Tells My Story!